Task cards are a great way to review and practice with concepts without overwhelming or boring students! 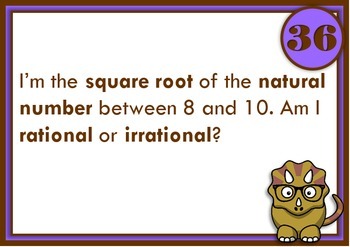 Students can work at their own pace answering one card at a time. 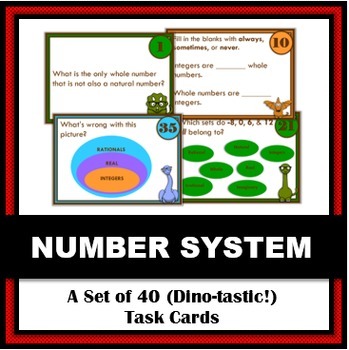 This set of 40 task cards provides lots of fun and practice with the Real Number System (and a bit of a nod to imaginary numbers)! 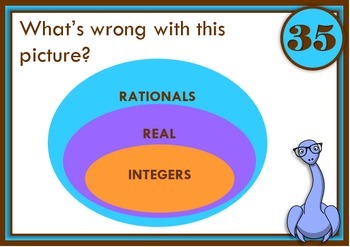 Activities range from quick, simple "identify the sets" activities to more creative fun like thinking about the infinite rational and irrational numbers between two whole numbers. All of the cards have a nerdy dino theme, but don't worry...these dinosaurs are friendly and not at all bite-y! 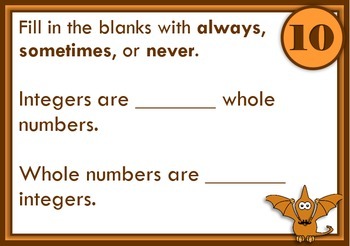 Cards are great for centers, tutoring, bell ringers, early finishers, or test prep.